3rd Generation Antiques have been offering professional experience and expertise in jewelry repair, custom jewelry creation, crystal and glass restoration for over 28 years. We offer the highest quality diamonds, gems, estate jewelry and antiques from our store in the heart of the Downtown Eustis, Florida. Our store collection includes pieces of timeless exceptional beauty. 3rd Generation Antiques is a one of a kind family owned and operated jewelry store that provides generations of knowledge and expertise, in an environment of integrity, education, service, and personal attention. 3rd Generation Antiques is more than a store full of beautiful jewelry. We are a family of people with a passion for antique and estate jewelry, history, antiques, fine diamonds and gems. We have a very special niche as very few jewelers specialize in estate jewelry, antiques, crystal and glass restoration. Our family includes gemologists, jewelers, appraisers, and artists. Our collection has been carefully curated and every piece of jewelry we sell has been carefully examined, the stones identified and graded, researched and evaluated. Some of 3rd Generation Antiques recent projects include refinished pieces for, The Charles Hosmer Morse Museum of American Art, Ripley's Believe It or Not Museum, Governor Lawton Chiles. and the Professional Golfers Association of America. Whether you desire assistance with a purchase, selling your jewelry, or choosing a gift for a loved one A variety of services is just a moment away. 3rd Generation Antiques is your trusted source. Meet Frank Bartle Jr. G.G., A.J.P. A graduate of the prestigious Gemological Institute of America, “ the world’s foremost authority in Gemology”, Frank Bartle Jr. is a fourth-generation jewelry professional. Mr. Bartle is a lifelong resident of Lake County, Florida. He has worked in the family jewelry store since age 12. 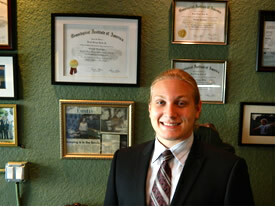 He was educated at Mount Dora Bible School and Umatilla High School before being accepted into the Graduate Gemologist program at the Gemological Institute of America in Carlsbad, California. While studying at G.I.A. Mr. Bartle received diplomas in the following courses; Graduate Diamonds,?Graduate Colored Stones, Accredited Jewelry Professional and Graduate Gemologist. Mr. Bartles knowledge of Diamonds, Gemstones and Jewelry will help customers in choosing the best value in their jewelry purchases. He will also be identifying Gemstones and appraising jewelry Tues-Friday 10AM-5PM. How Can I Protect My Jewelry Investment? The Jewelry Rider is a separate mini-policy or clause that extends your homeowners insurance to cover the extra value of jewelry that may be excluded under contents insurance. Your homeowner’s policy may not cover the cost of particular expensive items like jewelry and expensive watches or may limit reimbursement to an amount far below the actual value of those items. Your homeowner policy will cover jewelry under personal items, but the amount you can claim per item may be far below the actual value of any fine jewelry pieces you have. Jewelry may be the most commonly covered type of item under riders. A jewelry rider will typically cover particular pieces, and will pay out even if you lose the item outside your home. The cost of coverage will be minimal. In order to procure a jewelry rider a certified appraisal by a Graduate Gemologist is recommended. 3rd Generation Antiques © 2019 All rights reserved.